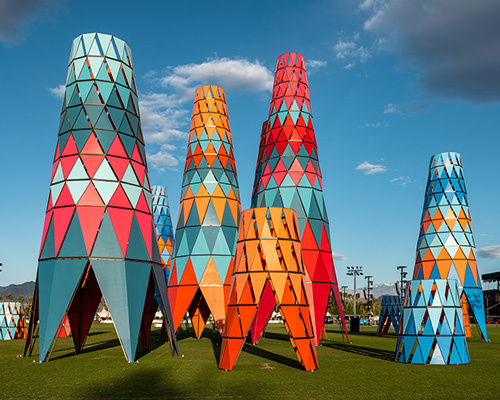 located close to the art center's central campus, the design is inspired by the traditional togunas of the dogon culture of mali. 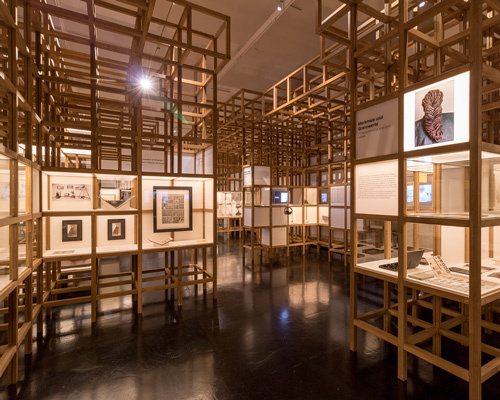 the exhibition presents 27 projects and six installations by the west african architect, showcasing his sustainable techniques with limited resources. 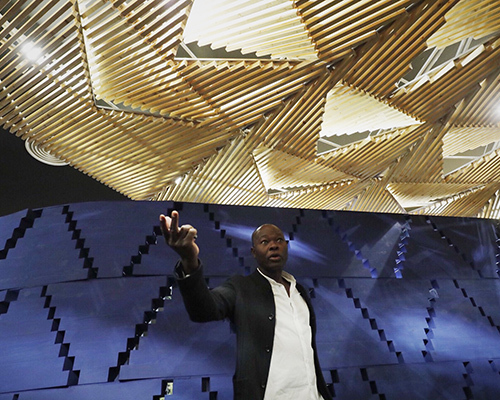 mimicking a tree's canopy, the highly-anticipated structure will remain on view until october 8, 2017.
designboom met with the architect who discussed his approach to teaching, his views on the state of architecture in burkina faso, and his insight into socially conscious design. 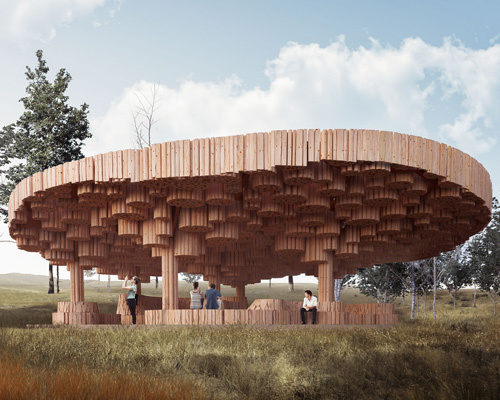 the tree-inspired scheme is a responsive structure that seeks to connect its visitors to nature and each other. 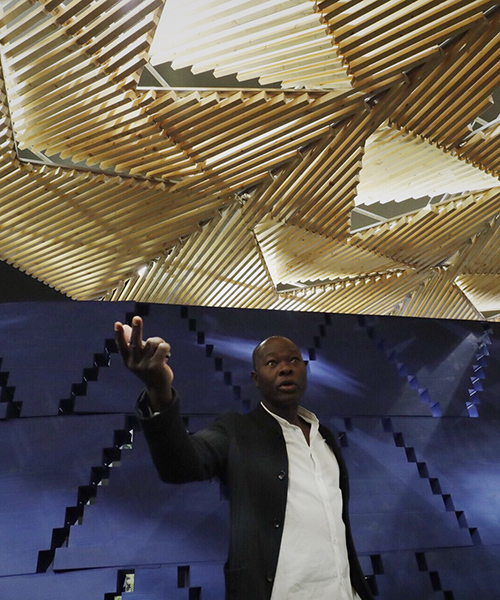 organized in partnership with the architekturmuseum der TU münchen, the design and materiality of the presentation is directly influenced by kéré's architecture. the scheme, which is presented at the 2016 venice architecture biennale, seeks to address the democratic values of transparency, openness, and equality. 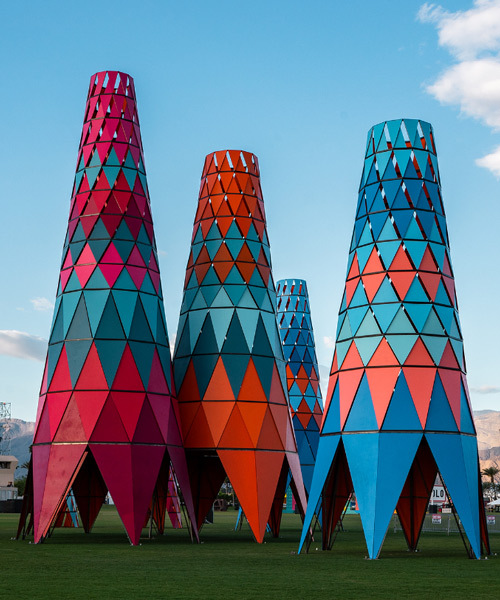 the installation is a conceptual interpretation of a typical african village; defined by an elevated platform surrounded by a landscape of wild grass. the development will primarily serve the local community of kogelo, but will also be a major educational resource for surrounding rural villages. in order to both preserve and celebrate the architectural heritage of the site, the scheme forms an understated design that offers long-term durability. developed as a joint venture between VITRA and the footwear company, the three month project explores experimental ideas for new retail concepts. 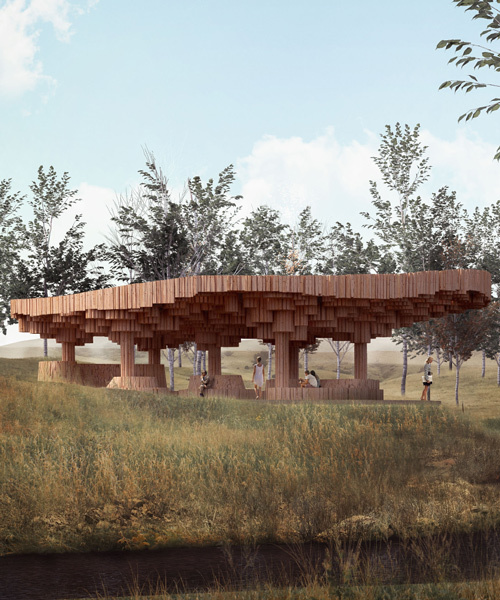 the structure will serve as a community center, focusing on the educational, cultural and sustainable needs of the village. the exhibition explores the essential elements of architecture, immersing guests within a multi-sensory experience. a large scale urban master plan aims to rebuild the city of laongo as a cultural, educational, and residential center based around sustainable living and construction. the infirmary will add a new dynamic to the opera village of burkina faso, using local materials and vernacular practices applied through contemporary means to fulfill important social and medical functions. 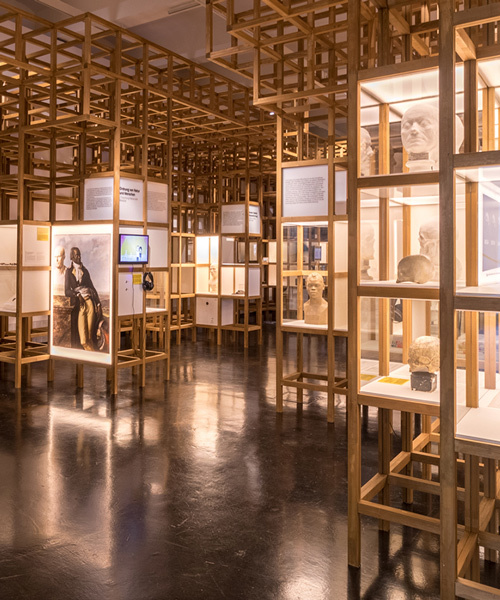 shigeru ban, francis kéré and gringo cardia have conceived the scenography for the permanent exhibition space at the red cross museum in geneva, switzerland. the 'public library in gando' is a freestanding addition to the primary school the firm completed some years before - one of the first educational buildings in the region. within this creative space, the firm wants to provide plane space which can be adapted in multiple ways, with the characteristic to change with time, according to the manners and needs of its users. climatic considerations largely determined the building’s form and materials. three classrooms are arranged in a linear fashion and separated by covered outdoor areas that can be used for teaching and play. the structure comprises traditional load-bearing walls made from stabilized and compressed earth blocks.